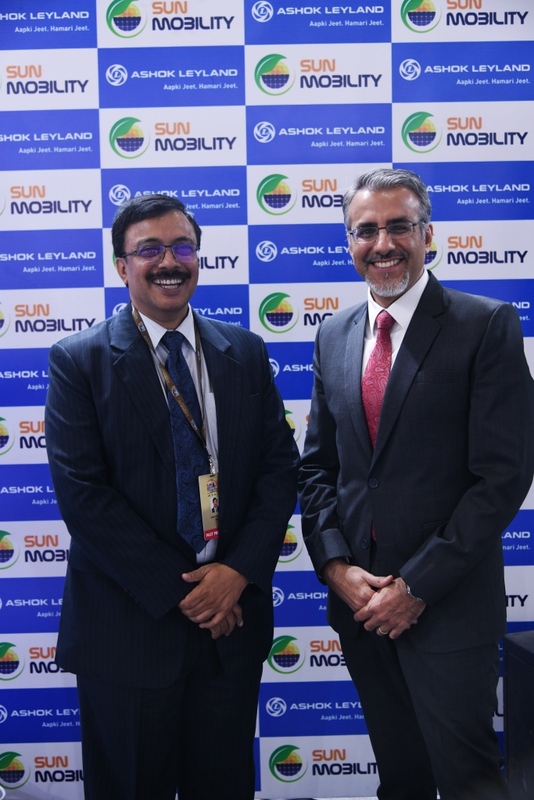 February 7, 2018, New Delhi: The global partnership between the Hinduja group flagship, Ashok Leyland and SUN Mobility, announced in July 2017, took wings at the Auto Expo 2018. 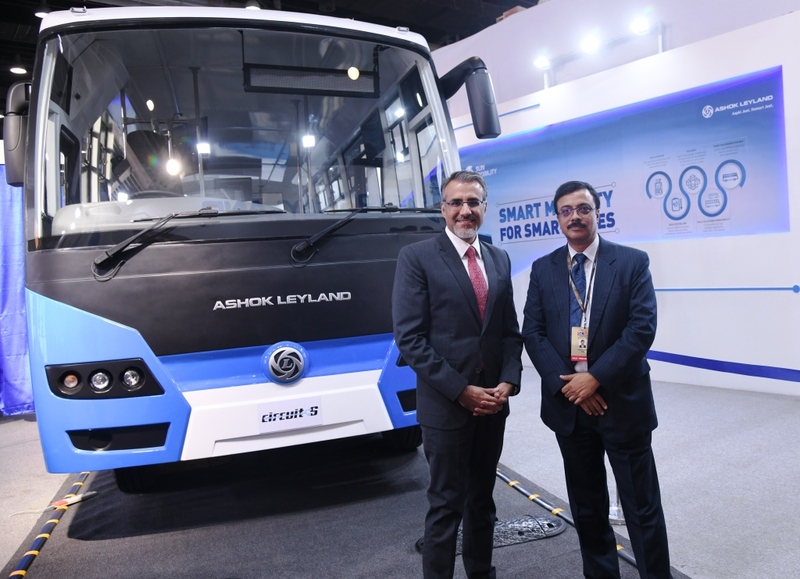 This partnership aimed at creating SMART Mobility solutions for SMART cities, took shape today with Ashok Leyland unveiling its first electric bus – Circuit-S – powered by SUN Mobility’s swappable Smart BatteryTM. The two companies have come together, leveraging India’s innovation and engineering potential to develop a truly world-class electric mobility solution. The first of its kind technology demonstration, is an example of ‘Design in India’ and ‘Make in India’ capabilities of India. This world class solution is the answer to India’s rising e-mobility needs and global demand for smarter solutions for public transport. In a move that is transformational for the mass transportation system in India, the Circuit- S, India’s First Swap Battery Bus which is designed for Indian conditions with seating capacity ranging from 25 – 35 seats, runs on easily swappable, smart batteries that are small and 1/4th the weight of a regular Li-ion battery. In a first of its kind demonstration, Ashok Leyland and SUN Mobility showcased the “refueling/swapping” of its electric bus in under 4 minutes, which is faster than conventional refueling along with the swapping of bus drivers and conductors at a depot. This solution, thereby, addresses issues of convenience and quick recharging options that have long been stumbling blocks for the acceptance and viability of electric vehicles for public transportation. “Our vision is to transform public transportation by designing, developing, and marketing a breakthrough, India-specific solution that makes our city buses emission-free, cost-effective and scalable,” said Mr. Vinod K. Dasari, Managing Director, Ashok Leyland. “We have been able to bring this unique, world-class solution to market within seven months of partnership with SUN Mobility. This idea has the power to change the way our public transport system works. We see this home-grown, world-class technology as the best solution for our Transport Authorities. The Circuit-S bus will cost lesser, would require minimal maintenance owing to lesser moving parts, will be lighter owing to smaller battery pack and most importantly, it will have zero tailpipe emissions. We certainly see this technology solution as the biggest enabler for our STUs and the biggest contributor to our nation’s mobility vision of becoming 100% electric,” he added. Ashok Leyland is a pioneer in introducing world-class technology into their buses. It was the first and only manufacturer to achieve BS-III emission compliance using a mechanical fuel pump. It was also the first in India to develop an SCR (Selective Catalytic Reduction) based BS-IV solution in 2010. In 2017, Ashok Leyland was the world’s first and only company to develop an EGR based BS-IV solution, called iEGR (Intelligent Exhaust Gas Recirculation). “The future of public mobility is undoubtedly electric. The SUN Mobility way combines smart batteries, quick interchange stations, clean energy – all linked to a smart network that for the first time brings truly disruptive innovation to the part of Urban Mobility that has the greatest impact on the way people commute.” said Mr. Chetan Maini, Co-Founder and Vice Chairman, SUN Mobility. 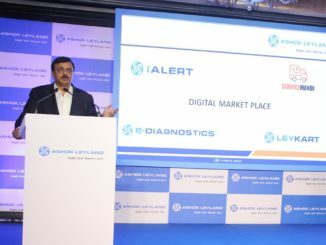 “Partnering with a market leader like Ashok Leyland, we have been able to bring to life, mass mobility solutions that are customized for India’s widespread public transportation needs,” he added. By separating the battery from the bus, for the first time, the upfront cost of the bus is drastically reduced to be at par with a traditional diesel bus. The bus is uniquely designed for Indian mass transport usage as the compact and light form factor of the battery allows for more passenger space and standing room. The swappable technology is compatible across a variety of bus platforms and works on the pay-per-use model of battery consumption. This brings down the total cost of vehicle operations; both maintenance and energy. SUN Mobility plans to build a network of Quick Interchange StationsTM that are easy to install and ensures quick refueling of busses to reduce down-time. The interchange station is customized for Indian conditions ensuring optimal use of real estate space for a range of vehicles to be swapped. These stations are compact and modular, allowing flexibility of shifting basis demand in a cost-effective manner. The Smart NetworkTM helps keep a constant check on the battery vitals, station operations and enables fleet management. Ashok Leyland, flagship of the Hinduja Group, is the fourth largest manufacturer of buses in the world and the 12th largest manufacturer of trucks globally. With a turnover of US $3.3 billion (2016-17) and a footprint that extends across 50 countries, Ashok Leyland is one of the most fully-integrated manufacturing companies, this side of the globe. Every day, over 70 million passengers use Ashok Leyland buses while its trucks keep the wheels of economies moving. With the largest fleet of logistics vehicles deployed in the Indian Army and partnerships with armed forces across the globe, the Company also helps to keep borders secure. Ranked 37th Best Brand in India in 2017, people, planet and profit for all stakeholders, especially its customers, is at the core of the Company which resonates with its philosophy of ‘Aapki Jeet. Hamari Jeet’. SUN Mobility is a global leader providing energy infrastructure and services to the transportation sector that is faster, cheaper and more convenient, making mass migration to a sustainable, pollution-free future possible. It is a 50:50 joint venture between Virya Mobility 5.0 and SUN New Energy Systems, pioneers in areas of electric mobility and clean energy. The company was established in April 2017 and is led by Chetan Maini, previously founder of Reva now Mahindra Reva, and Uday Khemka, Vice Chairman of SUN Group, two of India’s leaders in the new energy economy. The organization will work with STUs, fleet operators, shared mobility providers, and automotive OEMs across all platforms including 2/3 wheelers, cars and buses to challenge the status quo with an economical, scalable and smarter way forward.